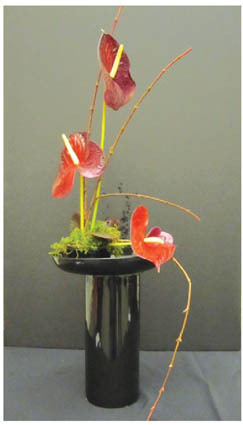 Rutland Garden Club’s flower show submission. May 30-31 — PROCTOR — The Rutland Garden Club, celebrating its 100th birthday, will present a standard flower show entitled “Songs of the Seasons,” Saturday and Sunday, May 30-31, at the Vermont Marble Museum. This will be the first Rutland Garden Club standard flower show since 2000. The show will be open to the public Saturday, May 30, from 12:30 to 5 p.m. and Sunday, May 31, from 10 a.m. to 4 p.m. Entries from Rutland Garden Club members, professional floral artists as well as amateur gardeners and designers will be on display. There will be three divisions judged by a panel of experts. Division I will feature judged floral designs including a Functional Table Design Breakfast Tray, an Illuminary class, a Small Design class, a Freedom of Style class, and an Underwater Challenge class. In Division II there will be well over 100 judged horticulture exhibits including Perennials, Classes on Hosta leaves and Branches to name a few. Division III will include special exhibits on bees, Vermont endangered and invasive plants and another on home solar technology. “In order to see a show of this caliber, you’d have to drive to Boston!” said Cleary. “It’s really going to be a fantastic show and I hope everyone takes advantage of the opportunity to see these great works… they’re impermanent art installations and they tell a story,” she added. This year the Rutland Garden Club is celebrating its 100 year as a service organization providing a social framework for the sharing of information and ideas on gardening and floral design. Through over 23 community gardens that they have designed, planted and maintained, garden therapy projects and flower shows helping to beautify the Rutland area and stimulate the public’s interest in all phases of gardening. The Rutland Garden Club is a registered 501(c)(3) non-profit organization. Admission to the museum is $5 for seniors and $7 for adults and teens. Entry for children is free. The Vermont Marble Museum is located at 52 Main Street in Proctor, Vt. It is open seven days a week through the summer season.